Home > Public Speaking Engagements > Where are Public Speakers Needed? Communications Departments – Larger corporations often have the need for public speakers to give lengthy or detailed talks to employees or the media. What they look for in public speaking candidates are individuals who can naturally engage a crowd, answer questions (including tough ones) with ease, and succinctly make points. Media Consultants – Some companies do not have the budget for communications departments (noted above), but still need someone to act as a conduit between them and the press/public. Thus, media consultants with expertise (and publication contacts) can handle this task on behalf of clientele. 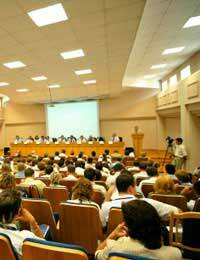 Educational Institutions – Many schools and universities relish hiring educators who are also outstanding public speakers. Why? The hiring personnel at these institutions know that holding a teaching degree doesn’t necessarily mean the educator has the ability to publicly speak. Event Planning Organisations – When individuals and companies require a public speaker for a corporate or social celebration or meeting, the first place they turn is often an event planning organisation. Many such places keep a list of strong public speakers (all of whom have expertise in different “topic areas”) and consequently operate as “brokers”, placing speech makers into speaking situations for a fee. Training Departments/Organisations – Exceptional public speakers are frequently plucked up by training departments or professional training organisations, even if the speakers don’t have the background or credentials to instruct the information they’ll eventually teach! This is due to the fact that many companies believe data can be learned, but being good “on stage” is an innate talent. Non-profit Agencies – Some nonprofits hire public speakers to help them emcee fundraising events or simply be the “voice” for their organisation. They know that even if the public speaker isn’t a member of their group, he or she can still be a huge asset as a positive “mouthpiece” or activist. Sales Departments/Agencies – A good salesperson who is a phenomenal public speaker is bound to get more clients than one who cannot address a crowd. Hence, selling professionals who also promote themselves as expert speech makers (and can back up those claims), can command first-rate salaries. Religious Organisations – There are quite a number of great public speakers associated with religious organisations throughout the world. Chances are they have become leaders in their spiritual fields because they have the intrinsic ability to connect with others on a meaningful level. Political Organisations – Finally, let us not forget to mention that politics and public speaking go hand-in-hand. Most well-known politicians have (or had) the ability to rouse an audience. We are glad it could be of help. Good luck. Hello I have spoken to many groups of people for over 29 years. These have included spiritual retreats inEngland, Prisons, Government Organizations and Military Establishments which are just a few. I have also spoken at spiritual retreats in Orlando Florida and other groups in USA from 2000 - 2010 visiting every 6 months. I am a recovering alcoholic and I took my last drink on 9 March 1983. I have a good sense of humor and enjoy speaking about my amazing life changing experience so that I may help others to see that their is a way out, a solution and a life beyond your wildest dreams. I have been told that I can reach places in people where only despair and darkness exists, where hope has almost died just a bear ember flickers to let you know someone inside is barely alive. Giving hope is the beginning, a thousand miles begins with one step! I love being among those who are lost or searching for a direction in this world full of distractions and disappointments and the illusion that all is ok when inside many are walking through an inner storm, battling winds, raging blizzards and when asked, ' are you OK'? the answer is usually, 'I'm fine thanks' Denial is the wall we surround our self with, we must it seems at all costs show the world we are. 'just fine' when the truth is we are falling apart. I want to show that there is a way to be free, to break out from our self made prison cell that has become a 'normal' way of life, a means of survival but the price is heavy, and brings unhappiness through pain and self torture. I want to share about my spiritual awaking a light that shone in my darkness the tears and hurt that was lifted and peace entered my life as never before. I believe what happened to me can happen to others by the very nature that I went to hell and returned! If you know of any groups that may benefit either those who need help or maybe people who know those who need help and don't know what to do. My life is spiritual based I would like to add at this point that I am not a spiritual guru or part of a cult, I do not push people in one direction or another, I simply tell my story and something happens! I do not charge any fees, freely I have received freely I give. Thank you Gerard.